The EXPERIMENTA WEEKEND is a rare opportunity to experience artist’s film and video within the concentrated space of the cinema. This annual survey brings together works that acknowledge a tradition of avant-garde filmmaking while taking us forward into the expanded field of contemporary moving image. Victor Alimpiev, Thom Andersen, Martin Arnold, Daniel Barrow, Neil Beloufa, Duncan Campbell, Thomas Comerford, Nathaniel Dorsky, Erin Espelie, David Gatten, Janie Geiser, Inger Lise Hansen, Lawrence Jordan, Richard Kerr, Lewis Klahr, Alexi Manis, Rebecca Meyers, Miranda Pennell, Samantha Rebello, Emily Richardson, Ben Rivers & Paul Harnden, John Smith, Phil Solomon, Peter Tscherkassky, Timoleon Wilkins. Eight curated programmes demonstrate the breadth and diversity of short-form practice and include works by Nathaniel Dorsky, Miranda Pennell, Ben Rivers, Peter Tscherkassky. Featured artist Lewis Klahr will introduce his evocative cut-out animations and Daniel Barrow performs live. Two installations by Emily Richardson and Martin Arnold, each memorialising very different cinematic institutions, will be shown continuously for one day each. An additional event at the Natural History Museum explores the legacy of Darwin and the Galapagos through a new film by David Gatten. The EXPERIMENTA WEEKEND is curated by Mark Webber, with assistance from Melissa Gronlund. Due to the popularity of the Experimenta Weekend over the past few years, we are introducing repeat screenings. Rather perversely, some of these additional screenings will take place before the weekend. Outside the weekend programme, the Festival’s Experimenta strand also includes features by John Akomfrah, James Benning, John Gianvito, Li Hongqui, Sharon Lockhart, and Ben Russell. Illuminated by the light of the projector, the interior of a large, 1920s picture house is documented from a central position in the stalls. 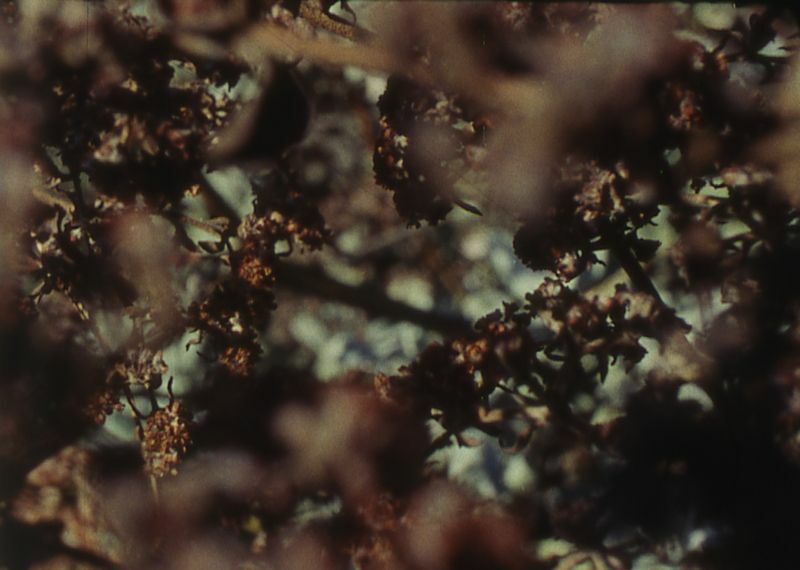 Emily Richardson’s films record impressions of environments ranging from natural landscapes to industrial or urban spaces. The Futurist is the first of a series in homage to the cinema experience. Co-commissioned by Lumen and imove, Yorkshire’s Legacy Trust programme. Funded by Legacy Trust UK, Arts Council and Yorkshire Forward. With thanks to Andrew Nesbit and Colin Bainbridge, The Futurist, Scarborough. Emily Richardson’s films explore landscapes and environments to reveal the way that activity, movement and light is inscribed in place. They focus the mind and eye to detail, finding transcendence and emotion in the everyday. ‘Time Frames’, a book on her work, is published by Stour Valley Arts, and a DVD featuring six of her films is available from LUX. Comerford’s essay maps a historical demarcation which originally divided Native American land from that which was ceded to white settlers in 1812. Modern life has obscured the traces of this history in the Rogers Park district of Chicago. Juxtaposing past with present, footage shot along this formerly disputed territory is matched with readings from official documents, fiction and quotidian accounts. A view across the city of Nicosia, over the Green Line border, to an unusual spectacle on a hillside. Lives continue in its shadow, amongst the contrasting flags, anthems and calls to prayer. An exploration of turn of the century colonial life along the Durand Line, the frontier between Afghanistan and British India (now Pakistan). Remarkable period photographs are closely analysed as we listen to reports of exchanges between westerners, natives and mullahs written by missionary doctor TL Pennell. 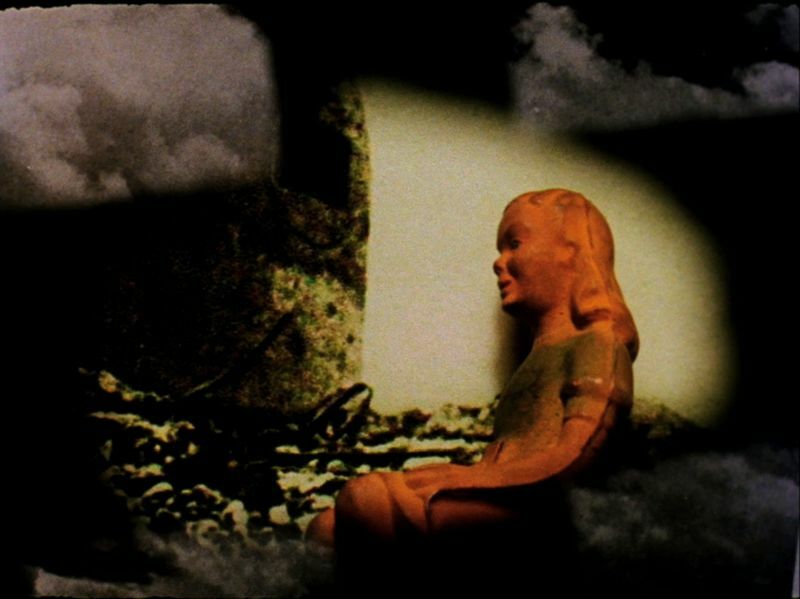 Over the last eight years, Chicago musician and filmmaker Thomas Comerford has been at work on a series of quietly-observed films that contemplate the entwined social, political, and environmental histories of Chicago (Figures in the Landscape, 2002; Land Marked / Marquette, 2005). The Indian Boundary Line follows a road in Chicago, Rogers Avenue, that traces the 1816 Treaty of St. Louis boundary between the United States and ‘Indian Territory’. In doing so, it examines the collision between the vernacular landscape, with its storefronts, short-cut footpaths and picnic tables, and the symbolic one, replete with historical markers, statues, and fences. Through its observations and audio-visual juxtapositions, The Indian Boundary Line meditates on a span of land in Chicago about 12 miles long, but suggests how this land and its history are an index for the shifting inhabitants, relationships, boundaries and ideas of landscape – as well as the consequences – which have accompanied the transformation of the New World. Shutter suggests the uncanny atmosphere and changing light on the day of a total eclipse. Blending 19th century American literature with factual accounts, illustrations and music by Debussy and Wagner, this oblique portrait of a shipwrecked coastline conveys the vastness and majesty of the ocean. A song to the sea, and a commemoration of those who have risked their lives off the treacherous Massachusetts shore. In the third film of her ‘inverted perspective’ trilogy, Hansen turns her camera on the North West Russia, creating monumental and uncanny vistas from these barren wastelands. Shot in Northern Russia, Travelling Fields is the third film in Inger Lise Hansen’s inverted perspective trilogy, following Proximity (2006) and Parallax (2009). 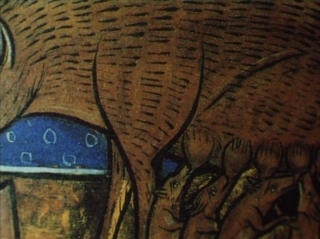 The films focus on a particular phenomenon occurring through a change of perspective and animated camera movements, as a way of redefining a place and its geography. In these films sections of the landscape are documented by moving the camera one frame at the time, along a track. As each of the earlier films focus on one particular location, Travelling Fields offers a more complex viewing as it moves between different topographies and locations in the Kola Peninsula. Daniel Barrow has developed an intimate mode of ‘manual animation’ using the antiquated technology of an overhead projector. 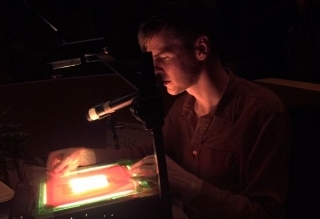 From a position amongst the audience, he recites live narration while manipulating layers of transparencies in continuous motion. Accentuated by interference patterns and sleight-of-hand trickery, Barrow’s hand-drawn images contrive an absorbing tale of comic book grotesques. EVERY TIME I SEE YOUR PICTURE I CRY is a bizarre confessional detailing the grand but hopeless scheme of an estranged garbage collector and failed art student. Unloved and rejected by society, the protagonist begins a universal art project in the form of a telephone directory of ‘profound and intimate insights’ to chronicle the lives of those around him. As he snoops through the windows and waste bins of fellow citizens, his survey is rendered futile by a maniacal killer who follows in his wake, picking off subjects one by one. Invoking introspection, pathos and dark humour, this award winning performance piece is accompanied by an unassuming Beach Boys-inflected score recorded by Amy Linton of The Aislers Set. Awarded the 2008 Images Prize at its premiere, Daniel Barrow’s ‘manual animation’ combines overhead projection with video, music, and live narration to tell the story of a garbage man with a vision to create an independent phone book chronicling the lives of each person in his city. In the late hours of the night, he sifts through garbage, collecting personal information and then traces pictures of each citizen through the windows of their homes as they sleep. What he doesn’t yet realize is that a deranged killer is trailing him, murdering each citizen he includes in his book, thus rendering his cataloguing efforts obsolete. The garbage man is a failed artist who fears becoming subject to the grip of something overwhelming. This animation traces his attempts to slow down and creatively reflect, in a process of coming to terms with his own self-loathing and fear. The story of the DeLorean car and its notorious entrepreneur’s Northern Ireland venture, assembled from found and reconstructed footage. During a momentous period in the province’s history, the manufacture of this futuristic vehicle was beset by its own troubles – governmental pacts, an inexperienced workforce and allegations of misconduct. This insightful film, with its Pinteresque finale concerning the plight of the workers, raises questions on documentary form and the representation of historical events. Andersen’s latest homage to Los Angeles takes time to stop and consider the temporary architecture of roadside billboards, community murals and hand-painted signs. A movie about the ephemeral sights of the city, with a rocking soundtrack of local music and the confused interjections of passers-by. Make it New John tells the story of the DeLorean car, its creator John DeLorean, and the workers of the Belfast-based car plant who built it. The film deftly contrasts the DeLorean dream with its spectacular downfall during a critical period in Northern Ireland’s history, and the canonisation of the car – the DMC12 – as a symbol of the American myth of mobility. The son of an immigrant Romanian foundry worker, John DeLorean’s natural talent for engineering took him to the top of Chevrolet, General Motors’ most important division. Leaving this behind he persuaded the British Government to back his new venture – building a factory in Dunmurry in Belfast to produce a new sports car. Almost immediately beset by financial difficulties and allegations of embezzlement, DeLorean’s attempts to keep the factory open became increasingly desperate and corrupt, eventually leading to his arrest by the FBI. The factory – which employed 2000 workers – closed in 1982, having produced just over 9000 cars. As with the earlier works Bernadette (2008) and Falls Burns Malone Fiddles (2003), in Make it New John Campbell fuses a documentary aesthetic with fictive moments, using existing news archives and documentary footage from the 1980s as well as new 16mm material which imagines conversations between DeLorean factory workers. Campbell questions the documentary genre and reflects here on broader existential themes and narrative drives. Alternately consumed by darkness and blinded by the light, Mickey and Pluto are caught in an eternal embrace by a film that refuses to end. In his films and digital works, Martin Arnold uses intense repetition or subtle substitution to reveal subliminal nuances beneath the surface of pre-existing footage. 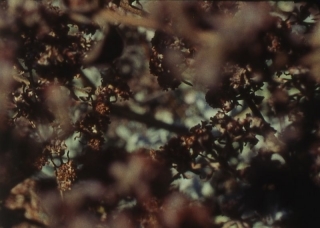 Martin Arnold achieved international recognition with a trilogy of 16mm films including pièce touchée (1989), passage á l’acte (1993) and Alone. Life Wastes Andy Hardy (1998). In recent years, he has produced and directed film installations in digital formats, such as Deanimated – The Invisible Ghost (2002), Silent Winds (2005) or Coverversion (2008). Martin Arnold is represented by Galerie Martin Janda, Vienna, and his films are distributed by Sixpackfilm and Lightcone. Nathaniel Dorsky finds moments of profound beauty among the shadows, reflections and luminosity of city life and the natural world. His open form of filmmaking creates a space for the viewer’s contemplation amidst the subtle and astonishing images which radiate from the screen. This programme presents two new films together with a recent preservation of a formative early work. Hours for Jerome has been preserved by Pacific Film Archive with support from the National Film Preservation Foundation. Collage artist Lewis Klahr introduces PROLIX SATORI, an ongoing series which appropriates images from comics, magazines and catalogues. A filmmaker since the 1980s, his signature style is saturated in mid-century Americana but addresses universal experience and is resolutely contemporary. Retaining distinctive handcrafted qualities across a recent shift to digital, Klahr choreographs comic book characters in fractured landscapes of patterns, textures and architectural details. Going beyond abstraction and nostalgic cliché, he builds high melodrama from modest means, conjuring elliptical narratives that evoke complex moods and emotions. Within PROLIX SATORI, a new project of ‘couplets’ elicits different atmospheres through repetitions of soundtracks or imagery. An emotive mix of classical, easy listening and iconic pop music carries viewers through tales of lost love and wistful reverie. This screening is a chance to be immersed in the idiosyncratic world of a widely acclaimed artist making his first UK appearance. Lewis Klahr will present a screening of his early films at Tate Modern on Monday 25 October. Videogaming was never meant to be this way: uncanny and elegiac in tone, poignant and considered in practice. By betraying the violent subtext of his source material, Solomon has found genuine poetry in the desolate spaces of digitally constructed worlds. The windows of a small antique store in the Rocky Mountains displays carefully arranged curiosities – specific objects each with their attendant histories. Visible traces of past uses, previous lives, secrets and significance. Words, concepts, things. Referencing Aristotle and illuminated manuscripts, Rebello asks ‘What is substance?’ Romanesque stone carvings are measured against latter-day beasts, seeking parity between medieval perception and a present-day embodiment. A voyage in the celestial realm, out beyond consciousness, steered by a master of mystical transformation. Wondrous visions are charted on star maps from the Harmonia Macrocosmica to a spellbinding drone track by John Davis.